And behold! 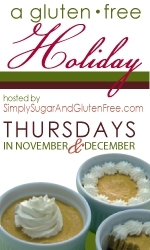 Week 3 of The Gluten-Free Holiday Event, hosted by SSGF, is already upon us. Yikes! Week 3! Really? How is this time flying by so quickly? Well, this week the lovely Alta, of Tasty Eats At Home, is in charge and she is focusing on Edible Holiday Gifts. 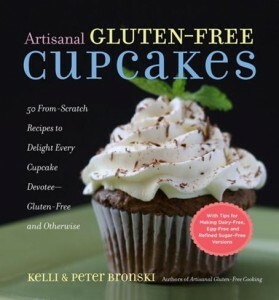 Go on over and check out Alta’s Gluten-Free Chipotle-Maple Mixed Nuts and go enter to win her giveaway of the Artisinal Gluten-Free Cupcakes Cookbook by Peter & Kelli Bronski. Week 2 – I shared my Thanksgiving Prep Series and a Candied Apple Cranberry Upside Down Cake in honor of Thanksgiving Favorites. 1. That name is a mouthful. I just could not think of something shorter. I am opening it up to suggestions for a new name. 2. I did not come up with this amazing idea. I just “borrowed” this one from Good Housekeeping. I also blame these on my new fascination with Pinterest. Beware if you click over to Pinterest. It is dangerous. And addicting. And strangely…a bit therapeutic. But I warned you. Don’t say I didn’t. 3. You do not need hot chocolate to enjoy these. Trust me. I eat them straight off the stick. This really bothers my boys. They like to play by the rules. Remember the long name above? 4. These are way too easy to make. You feel like you are cheating. These are my kind of gift. If you receive these as a gift from me, do not feel that you are being short-changed because I said they were easy. Just know that the little time I did spend on these was filled with total and complete love for you. I cross my heart. 5. Sometimes you just need a good chocolate covered marshmallow. Yes. There. I said it. On the note of those marshmallows, I have attempted to make my own three times before. Although they tasted wonderful, I did not really enjoy the big sticky mess that was involved. Instead, on the rare occasions that we have these treats, I buy my house-made marshmallows from Sweet Republic, our favorite ice cream shop here in town (and voted as one of the top 10 Ice Cream shops in America by Bon Appetit Magazine). Their marshmallows, along with absolutely everything on their menu, are made from scratch with only the highest quality ingredients. There are no artificial flavors, colors, preservatives or hydrogenated oils in any of their products – only what nature intended. They have gluten free and dairy free treats all over their shop. We do not go often, but every now and then we do indulge. If you decide to make your own marshmallows, here are the three recipes I have used in the past. Two are allergy-friendly, the third contains eggs. If you purchase your own instead of making them…MAKE SURE TO READ YOUR INGREDIENTS CAREFULLY. Homemade Marshmallows (Sugar and Corn-Syrup Free) from Z’s Cup of Tea. And if you want to order your VEGAN Marshmallows, Sweet and Sara is your place to order from! Their Vegan Marshmallows are handmade in a Vegan Facility. 1. Place a marshmallow on each of the Sticks. Place crushed candy cane pieces in small bowl. 2. Place chocolate in medium heat-proof glass bowl and place bowl over pot of simmering water. Make sure bowl fits snugly on pot and that bottom of bowl does not touch water inside – just rests on lip of pot. Stir chocolate constantly with rubber spatula until melted, shiny and smooth. Do NOT allow any water to get into chocolate – chocolate will seize immediately! 3. Use a spoon to pour chocolate evenly over each marshmallow. Do not dip marshmallow into chocolate. This could cause your melted chocolate in bowl to harden. Using back of spoon, spin marshmallow piece while smoothing chocolate. Make sure to cover the top of the marshmallow but leave the end where the stick enters uncovered. 4. 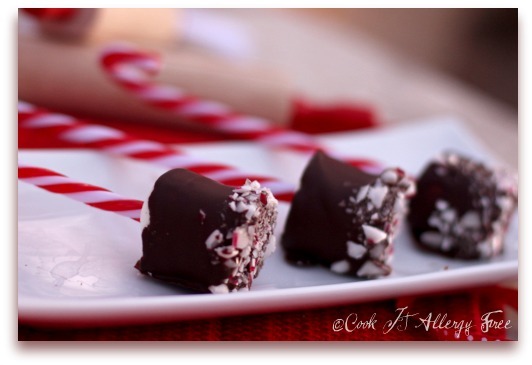 Before chocolate hardens, dip just the tops of the covered marshmallow pieces into your bowl of crushed peppermint candies. Then place on parchment paper to set. Enjoy as is, or use as your hot chocolate stirrer. These package easily for gifts. What edible gifts do you make during the holidays? Tell me! I love new ideas. Just got back from Phoenix this week…I thought of you! And again, your pictures are an inspiration…..one day….hopefully I’ll have you knack for staging! Ahh! Thanks so much, Tessa! I just added your corn-free recipe to my post. That looks like another wonderful recipe and a great addition to the list! Thanks so much for the kind words about my photos., too. You are too kind. By the way, I was reading your “about” page and your nursing stories sound EXACTLY like mine. That is what put me on the path of nutrition in the first place and lead me to figure out about my son’s issues with gluten as well as dairy. Figuring out what I could eat while nursing seemed to become a full-time all consuming job! Hope you had fun in Phoenix! At least you had some nice weather! definitely better than here in Oregon!! It is amazing how many people still don’t know to link what mommy’s eating to a fussy baby..I wish more doctors pointed mom’s in that direction….it can make a world of difference! thanks for adding my marshmallows! I will link back to you too! Oh and i added you to my favorite blog list!! Sooo awesome Kim! Callum will LOVE these. I am so envious of your marshmallow, gf and df store! Sweet and Sara is what we usually get. I’ve never made my own, it kind of scares me. I think the kids and I will have to try it though! Also, my inspiration was Pinterest! Too funny, right? I LOVE it. In fact, I pinned one of your pics since they are PERFECT! Oh these are too cute! My youngest son would love them…me too! Oh my goodness… these look marvelous! Very festive. Yes, that Pinterest can make you do all kinds of fun things and distract you from work. Oh yea, these would never make it into the hot chocolate in my house. Yum….and so very pretty. OMG Kim!!! These are the cutest things ever! You talented genius you! 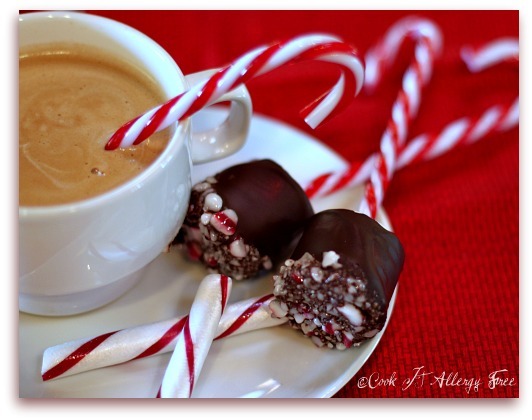 I agree with your first commenter – these would be the perfect accompaniment to a hot cup of cocoa. This looks like a great project for when the g-kids arrive. Now these make me wish we had cold Christmas weather, instead of our 30* day today! So very very cute indeed! 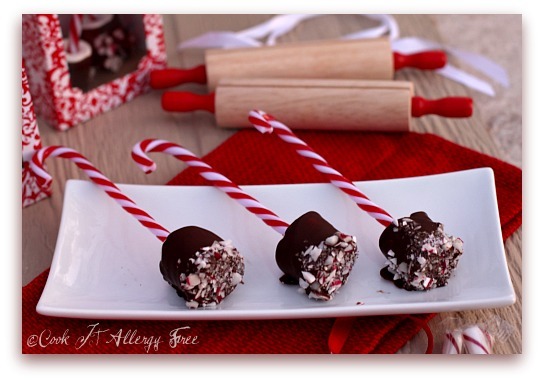 Now that is a gluten-free treat that my little guy would love over the holidays! He’s learned (as have my older boys) that gluten-free doesn’t mean you miss out on anything – in fact my non-allergic kids have figured out that there are lots of things they like that happen to be gluten-free too. Your idea or not, the execution is GORGEOUS! Thanks to you I’m addicted to Pinterest. I’ve seen these on your board I believe. I like the ones with caramel since I don’t like mint with chocolate. But I would love to make these for teacher gifts. I also want some of those marshmallows from that store near you. Gosh I need to fly out there! My word those are wonderful looking and I think the perfect treat for my guy. 🙂 Thanks for the link to the corn free version. I will be attempting those tomorrow. Just made these! Such a treat for us gf/df folks (can I just say that my prayers have been answered with Enjoy Life’s chocolate chunks??). I have a cookie exchange tomorrow with all “normal” people and one celiac, so these are perfect to bring to the party! Rachel, thanks so much for letting me know you made these!! Hope they were hit at your cookie exchange! So excited to try these….on their own and for stirring cocoa. My kids & I will enjoy making these. 🙂 I am afraid to try Pinterest….Facebook and Twitter already take up way too much of my time! But I am very tempted…. 😉 Thanks for all of the wonderful, kid-friendly ideas you put out there!